HANOI (AFP) – Planned naval exercises between South Korea and the United States are a threat to global peace, and new sanctions reinforce a "hostile" policy towards Pyongyang, North Korea said Thursday. "Such movements pose a great threat not only to the peace and security of the Korean peninsula but also to global peace and security," said Ri Tong Il, spokesman for the North Korean delegation at regional security talks in Hanoi. US Defense Secretary Robert Gates and his South Korean counterpart Kim Tae-Young announced the drills on Tuesday, saying they were designed "to send a clear message to North Korea that its aggressive behavior must stop". The manoeuvres begin on Sunday with tensions rising over the sinking in March of the South Korean warship Cheonan. US Secretary of State Hillary Clinton, in Seoul before heading to Vietnam for Friday's ASEAN Regional Forum security talks, announced new sanctions against Pyongyang on Wednesday. "If the US is truly interested in the denuclearisation of the Korean peninsula, it must take the lead in creating an atmosphere (for dialogue) rather than hurting such an atmosphere by staging military exercises or imposing sanctions," Ri said. "The sanctions are a clear expression of an amplified and intensified hostile policy against the DPRK," he added, referring to North Korea by its formal initials. Washington has made a major show of support for its ally Seoul. Ri said the US moves violated the spirit of a July 9 United Nations Security Council statement on the Cheonan sinking. The UN condemned the attack as a threat to regional peace and called for "appropriate and peaceful measures" against those responsible. The UN expressed deep concern at the findings of the multinational investigation team, but noted the North's denial of responsibility and did not apportion blame. Clinton said the new sanctions were directed at North Korea's "destabilising, illicit and provocative policies". 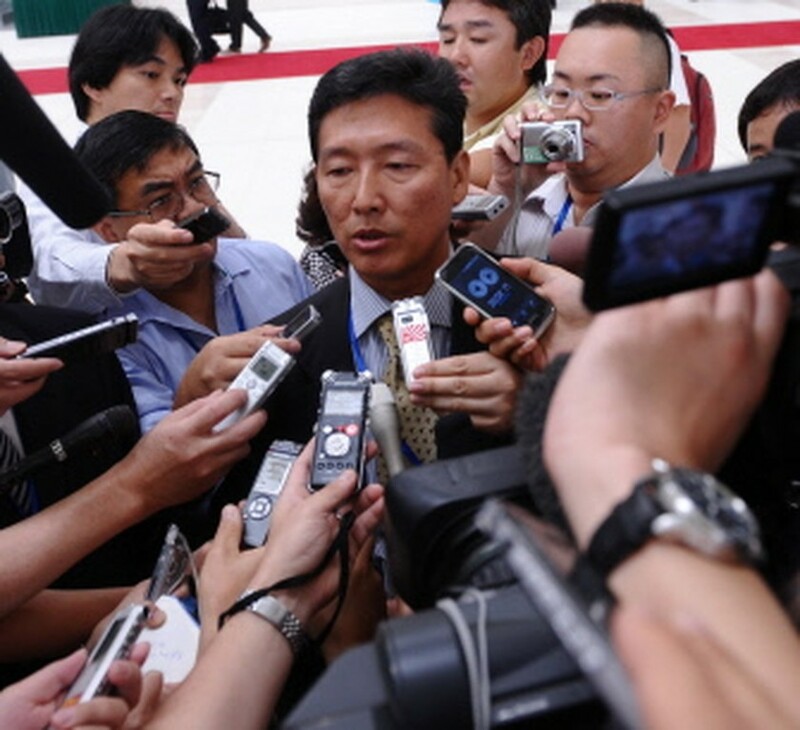 Ri spoke to reporters after North Korea's Foreign Minister Pak Ui-Chun met Yang Jiechi, the foreign minister of China. Pak refused to comment, and security guards shoved and manhandled a crowd of cameramen and reporters who surrounded him. Yang also said nothing after the meeting. The US called Wednesday for Beijing to look at additional steps to pressure North Korea. Meanwhile, North Korea's military will hold more talks Friday at the border truce village of Panmunjom with the US-led United Nations Command about the sinking of the South Korean warship, the Command said. The UN Command, which enforces the armistice that ended the 1950-53 war, said in a statement the colonel-level talks first held last week would resume at 10 am (0100 GMT). At the previous meeting, the North demanded the right to send a high-level team to the South to inspect evidence dredged from the seabed, including what Seoul and other investigators say is part of a North Korean torpedo. The South has already rejected the demand, saying the UN Command should handle the case as a serious breach of the armistice. The colonel-level talks are intended to prepare for discussions between generals from the two sides. But the North last week said US forces should press Seoul to accept its investigation team before any higher-level talks are held.